Here’s part one of the Chimney Rabbit Best of 2014. As with last year, I’m splitting the list into three categories – children’s books, adult books, and comics. Part one is comics – a broad term that encompasses web comics, printed comics, graphic novels, and manga. Same rules as before. The publication date has absolutely no bearing. This is purely a list of the best comics I read in 2014. Hawkeye, the story of the world’s greatest archer when he’s not hanging out with the Avengers, was the best ongoing sort-of-superhero comic of last year, and this year is no different. 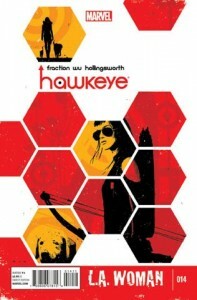 Things have changed – half the stories are now about Kate Bishop, the other Hawkeye, who has decamped to the West coast. The artists have changed, too, with David Aja’s East coast stories being complemented by Javier Pulido and Annie Wu’s West coast action. The split storylines make for a slightly disjointed narrative, but I usually get a stack of three comics at a time from Page 45 in Nottingham, so it works out OK. With the exception of the new Sandman series, which is in far too early a stage to judge, this is the only ongoing series I’m still buying. Which shows just how good it is. I bought I Am Fire in Page 45 in Nottingham, after picking up a copy of Rachael Smith’s One Good Thing at the Leicester Comic Con. 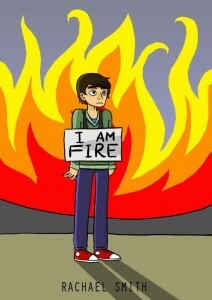 One Good Thing is an exceptional diary-style comic, but it’s I Am Fire that shows a tremendous maturity of talent. I don’t know if she’s inspired by John Allison, but when I say that I Am Fire reminds me of Bad Machinery and Scary Go Round, that’s about as big a compliment as I can pay an artist and writer. 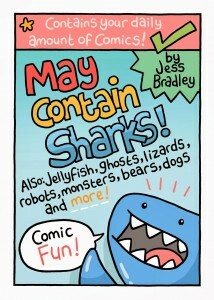 May Contain Sharks was bought in Page 45 on a complete whim as it was sitting on the counter looking all mad and fun and exciting. A series of one-page silly comics in Jess Bradley’s inimitable style, from the Smartest Bear in the World to my personal favourite, the Red Panda – Nature’s Jerk. Bright, colourful, dynamic, cute, and never less than utterly, utterly, silly, if this doesn’t bring a smile to your face, then you’re dead inside. 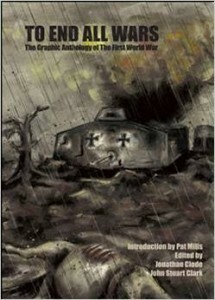 To End All Wars is a 300-page hardback anthology of graphic stories about the First World War. From comic legend Pat Mills’ fiery, passionate, and angry introduction through the 27 stories, told in a variety of styles, with diverse artwork, this volume is gripping from start to finish. This is not a boys’ own adventure. This is a savage indictment of the madness that led Europe into a war that slaughtered a generation. In this centenary year of the start of the First World War, this is an important counterpoint to the at-times jingoistic and self-congratulatory commemorations that have filled our newspapers and television screens. Last year, my best comic of 2013 was John Allison’s Bad Machinery volume 1, and I made the rash prediction that Bad Machinery volume 2 would be the number one in 2014. I was wrong. Because while The Case of the Good Boy was brilliant, exciting, and as wonderful as you’d expect from Mr. Allison, and it would have topped this list, there’s something even better. 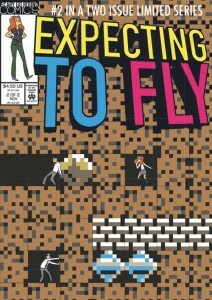 Expecting to Fly is a two-issue limited series, done in classic 1996 Marvel-homage style (complete with fake, tone-perfect adverts for subscriptions to non-existent comics) that takes us into the back story of some of Allison’s best-loved characters, Shelly, Ryan, and Tim, while they were at school. There’s no mystery to be solved, no supernatural shenanigans – this is the familiar Scary Go Round/Bad Machinery universe stripped down to its most basic level – its characters. It’s funny (and I mean really funny), it’s dark, it’s touching, it’s visually inventive, melancholy and uplifting at the same time. 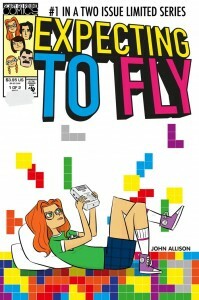 The artwork is effortless, and the dialogue sparkles as you’d expect from John Allison. This is, quite possibly, the finest thing he’s ever written. I am making no predictions about next year’s best comic. But it’s going to require some spectacular effort to overtake Expecting to Fly.